In Pacitan there is a beach which is lies only about 3.5 km away from the city center. So we can get there in a matter of minutes named Teleng Ria Beach. Teleng Ria Beach is a white sandy beach which is very fitting to be a destination of refreshing impromptu. The beach has high wave. Some visitors are often surfing on the beach to utilize of the high waves. This place is also often used as a place for beginners who learn to surf. Many activities we can do at the beach. Besides surfing you can also relieve stress by relaxing walk down the beach. 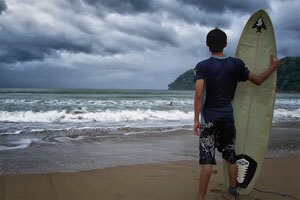 Or you can also swim at Teleng Ria Beach because the waves are not too dangerous for swimming. But be careful if you want to swim at this beach on June to August because on this month the jellyfish will be migration by passing the seaside. In these months there will usually appeal installed around the beach to remind visitors. If you want to see the fishing activities of the fishermen you can walk to the west coast. There you will find fishing boats were in the parking lot as well as the fishermen who conduct various activities.